Three persons were shot dead on Friday night in Zanwra area of Jebbu Miango, Bassa Local Government Area of Plateau State by suspected Fulani herdsmen, throwing the whole community into a fresh apprehension. 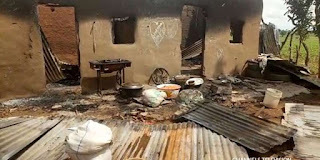 The killing took place barely three days after the peace and security conference organised by the Plateau State Peace Building Agency in collaboration with the United States Institute for Peace , Justice, and Security and financed by US Embassy in Nigeria. While one expended shell of 7.62mm ammunition was recovered at the scene of the incident, the victims were said to have been buried by their relations according to the tradition of Irigwe ethnic group. The attackers were said to have struck at 8 pm, a few hours after the visit of the new Commander of Special Military Taskforce codenamed ‘Operation Safe Haven’, Maj. Gen. Augustine Agundu to the area. The spokesperson for the Plateau State Police Command, Matthias Tyopev, a Deputy Superintendent of Police, confirmed the killing on Saturday, saying investigation had commenced. He said, “Today, being Saturday, August 4 at 0745 hrs, the Nigeria Police Force, Plateau State Command, Jos received an information that on August 3 at about 1830 hrs, unknown armed men suspected to be Fulani herdsmen attacked Zanwra area of Jebbu Miango, Bassa LGA. As a result of the attack three persons were shot dead. “They are; Emmanuel Gado ‘M’ aged 22, Ladi Monday ‘F’ age 30 and Mary Monday ‘F’ aged 5 years. Police detectives led by the Divisional Crime Officer of Bassa Police Division mobilised to the scene of crime. One expended shell of 7.62mm ammunition was recovered, Photographs of the corpses were also taken.